While about 80% of tooth decay occurs on the surface of the tooth, a sizable percentage of these lesions go undetected when using traditional dental procedures and instruments. Conventional methods of finding decay, such as the use of the dental explorer or bite-wing radiographs, are very often ineffective in detecting defects of the enamel. Through several studies, the DIAGNOdent has been proven to be the most accurate system for the early detection of tooth decay. Sometimes diagnostic decisions are made based on the inappropriate use of a dental explorer to determine the status of the fissure. There have been studies that show there is solid evidence to support the actual elimination of the use of dental explorer tools as the primary diagnostic tool regarding tooth decay. Our goal is prevention which means the nature of the examination for dental decay should change from the detection of advanced tooth decay that requires restoration, to the early detection of lesions at the precavitation stage that could be reversed if the enamel remains intact. The introduction of new detection devices like the DIAGNOdent has made it possible for clinicians to effectively identify the presence of occlusal decay and treat the tooth in a non-invasive manner. The advanced technology of the DIAGNOdent, a 655 nm diode laser, allows for the detection of low-level pit-and-fissure tooth decay, as well as smooth surface caries at a much earlier stage than visual inspection..
At Halonen Family Dentistry, we know healthy smile is invaluable. 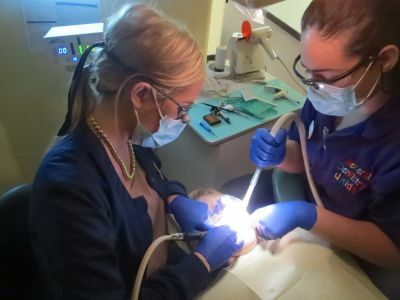 In order to maintain your pearly whites, the earliest possible treatment and care for any dental issues is essential even in pediatric dentistry. DIAGNOdent aids in the early detection of dental caries and small lesions which gives you time to protect and preserve your teeth. Call our dental office in Battle Creek to discuss your dental health today!